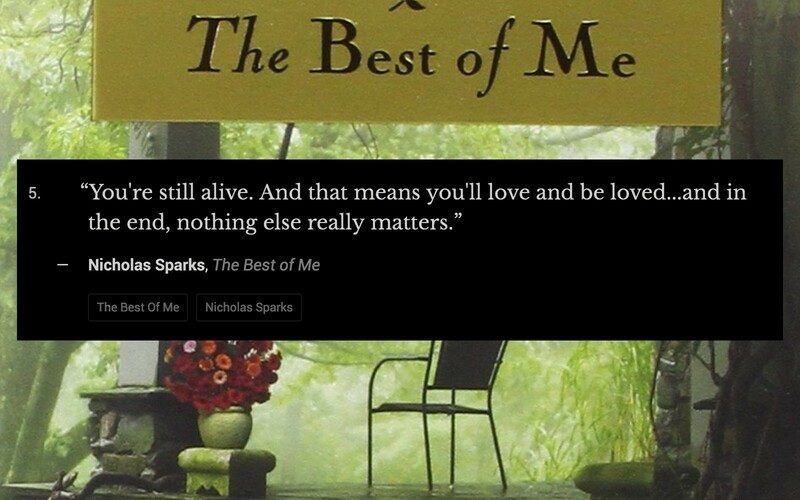 Read these heartbreaking quotes about the power of love from 'The Best Of Me'. There's a lot of magic between you too, ain't no denying that. And magic makes forgettin' hard. You're still alive. And that means you'll love and be loved...and in the end, nothing else really matters. Were all first loves like that? Somehow she doubted it; even now it struck her as being more real than anything she'd ever known. Sometimes it saddened her to think that she'd never experience that kind of feeling again, but then life had a way of stamping out that intensity of passion; she'd learned all too well that love wasn't always enough. Even if I thought he was perfect for her." She turned to face him. "What were we thinking?" "We weren't," he said. "We were in love. I knew you loved me and that you'd do anything for me. And that was one of the reasons it hurt so much when you ended it, Dawson. Because I knew even then how rare that kind of love is. Only the luckiest people get to experience it at all. Dawson, she knew, had saved Alan's life- but in the end, he'd saved Jared's as well. And for her that meant...everything. 'I gave you the best of me,' he'd told her once, and with every beat of her son's heart, she knew he'd done exactly that. She understood then, with the distance that maturity brings, how much he'd loved her back then. And still did, something whispered inside her, and all at once she had the strange impression that everything they'd shared in the past had been the opening chapters in a book with a conclusion that had yet to be written. She had known the kind of love that was worth risking everything for, the kind of love that was as rare as a glimpse of heaven. Peeking in the rearview mirror as she pulled away, she saw that Dawson was still standing where she’d left him, as if hoping she’d change her mind and turn the car around. She felt the stirrings of something dangerous, something she’d been trying to deny. He still loved her, she was certain of that now, and the realization was intoxicating. She knew it was wrong, and she tried to force the feeling away, but Dawson and their past had taken root once more, and she could no longer deny the simple truth that for the first time in years, she’d felt like she’d finally come home.